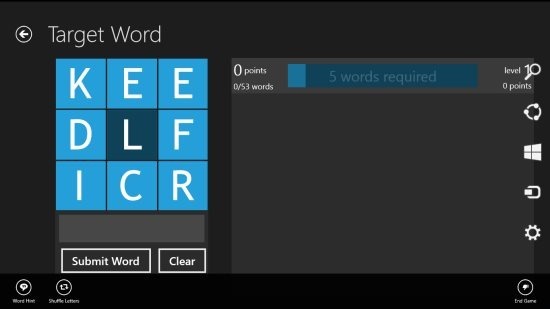 Target Word App is a free word puzzle game for Windows 8 in which users need to make 4 to 5 words consist of at least four characters, using the target letter located at the centre of the alphabet box. This word puzzle game increases it’s word limit as the level increases and you have to get through the required words to reach the next level. Windows 8 Target Word app helps you test and improve your vocabulary skills. As you enter the game, it shows the instructions on how to play this game for Windows 8. Offers hint option if you stuck. Make a word using minimum of four letters. You can change the characters by using the shuffle letter option. You can view the high scores with a click on high score option. Enables you to see the word definition. This Windows 8 puzzle game app is very easy to play. All you have to do is to make the required words by using the nine characters mentioned in the puzzle box, however, make sure the use of target letter is the center one. And in case, you are unable to solve the puzzle at once, you can quickly shuffle the letters by clicking the right mouse button and selecting the shuffle option. Else, you can take a hint by selecting the hint option. Try to use this option as low as possible because this option normally deduct your points. The best part of this word puzzle game is that you can even see the definition of words. Another good part is that you can resume the game in case you have closed the game. You can also check out our post on Music Streaming App for Windows 8. In short, Target Word app is an excellent puzzle game app for Windows 8 in which users have to brainstorm their minds to solve the puzzle successfully. Go ahead and try this app within Windows 8 App Store.